I’m gonna jump right into this. As every Star Wars fan should know there is a new Star Wars movie coming out at the end of this year: Star Wars Episode VII: The Force Awakens. We even got a new trailer for it recently. But further news which most fans find just as exciting is a new Battlefront game coming out a month before The Force Awakens is released. The Battlefront series is one of those “incredibly loved” Star Wars games, and if you don’t know what Battlefront is then I suggest you find a copy of Battlefront II and learn happiness. In Battlefront you were a grunt soldier in the Star Wars universe. Gameplay was usually third-person, sometimes first-person, combat. Players would begin a match on a large battlefield and have access to various different character classes. They’d capture objective locations and try to win the battle by holding these spawn points and depleting the other army’s forces to zero. Battlefront II introduced hero characters as well, allowing you to play as named individuals from the Star Wars universe like Luke Skywalker or Chewbacca. It was incredibly fun to experience. The open battlefields made you feel like you were just a small part of a larger galaxy than many single-player games would. You are one soldier among many, and the war is won because of the actions of individuals like you; not a bunch of gung-ho PCs. Um, good job CT-7891-9640-82….. uh, take a break. DICE, the company most famous for Battlefield and Mirror’s Edge, is developing the new installment to the main Battlefront series, erroneously named “Battlefront” instead of Battlefront III or Battlefront 2015 or something because apparently game developers like confusing people (I’ve learned that the reason for the name is because DICE isn’t considering this a continuation of the series; take that as you will). They are a subsidary of EA Games, an extremely troubling fact due to the way that EA tends to treat its playerbase. Still, I had been optimistically and excitedly awaiting information on this game for a long time now; years even. Finally, with Celebration Anaheim finishing up we have been given our first glimpse at the game and some information about what we can expect. And I have to say, so far I’m disappointed. The glimpse we were given was a pre-rendered trailer; a “reveal” trailer (which you can see here) despite the fact that the game was announced a while ago with a Hoth-based teaser at E3 2014. I think I speak for many when I say that I was really hoping for some gameplay footage with this trailer. We’ve known about the game for a long time now. It’s coming out in seven months. We want to see some footage of the game actually being played. Pre-rendered footage can be pretty and well done, but it does nothing to show what kind of game you are getting. DICE and EA also made what is, in my mind, a scummy move. That reveal trailer has the words “Game Engine Footage” stamped across the bottom of it. Why, you ask, am I upset about this? Because I’ve had a few friends say to me “Wow, this game looks so good! I can’t wait to play with those graphics!” after watching the trailer. And that’s frustrating, because EA is banking on the fact that most people don’t know the difference between what “game engine footage” and “in-game footage” are. Footage made in the game engine is assumed by many to be footage of the game, because of course the word game is purposely used in that description to misdirect people. People know what a pre-rendered trailer is. They understand that it is not indicative of the actual graphics in a game; it’s just a pretty movie that someone made to get people hyped. By calling the trailer “game engine footage” it tricks people into thinking that it’s not a pre-rendered trailer. But game engine footage is also pre-rendered footage. It’s just pre-rendered within the engine that the game will be using. But this means bupkis about what the game will look like when released. A game needs to render its graphics and artificial lighting in real time as you play through it. The movements of characters are based on pre-made animations. And these are all factors that force developers to cut quality for the final release. They have no choice. But a trailer can be made ahead of time. It can be tweaked and perfected and rendered for a couple of hours before anyone sees the final product. Trailers very often lie; especially pre-rendered ones. We saw this painfully in Watchdogs. It’s likely that the released version of Battlefront will still look very pretty, don’t get me wrong; we are talking about PCs and Next-gen consoles after all; plenty of games look very pretty on them. But, I don’t think anyone should be using a pre-rendered trailer as evidence for what the actual game will definitely look like. Honestly, the graphics are the least of my worries with Battlefront. My real concern is how much of a step back they seem to be taking with the title. In Battlefront (that is, the first one released in 2004) we could have massive 64-player multiplayer battles on Windows and Macs (sadly, consoles were limited to 32-player battles due to technical limitations). Your available single-player game modes included a campaign (where you’d pick either the Clone Wars or Galactic Civil War and play through key moments in each), Galactic Conquest (which was a turn-based match where players would pick an army and then use strategy to conquer planets and try to control the galaxy), and Instant Action (where you could simply drop into a bunch of matches using whatever settings you preferred). As the first game in the series it was quite bare-bones but still included a host of content and fun gameplay. Battlefront II (released in 2005) had everything that Battlefront had, only redone (mostly) better. The campaign was a much more narrative experience where you played as a trooper in the 501st, fighting from the Clone Wars all the way through the movies’ galactic history to Endor. The game added hero units (Jedi, bounty hunters, and others from the films who could be temporarily played like any other unit), new game modes like Hero Assault (both teams are composed solely of hero units, and I have to say Grievous was one of my favorites here), and much loved space battles which allowed you to actually fly into capital ships and destroy them from within. Multiplayer battles again supported 64 players on PC and 32 on Xbox, though PS2 players could only have 24 players per game. Despite those technical limitations Battlefront II was an extremely well-liked product. Most of my enjoyment over the series is felt through this game. You would expect DICE’s Battlefront to keep this pattern of improving the series as time goes on, especially with a 10 year gap between main series titles (even knowing that this is a “reboot” of the franchise). It’d be difficult to completely screw it up; at worst simply giving us Battlefront II but with improved graphics and 64-player battles across all systems would be acceptable. We should have the tech for that by now. But we aren’t even getting close to that. Is a massive persistent battle where strategy and battlefield tactics comes into play really too much to ask? We don’t have a lot of information yet, but what we do have is extremely telling (and almost universally not in a good way). Something positive to speak about is the quality of the graphics and the designs in the game; DICE has taken direct scans of the actual models and locations used during the filming of Star Wars, meaning that their X-Wings are actually the X-Wings of the films, the environments are perfect replicas of the locations where Star Wars was filmed, etc. That’s really cool, but graphics make not a game great, and all of the non-visual information we have is frustrating to hear about. Battles will be restricted to 40 players per match; that’s higher than in the past for consoles, but substantially lower for PC. The game will feature no campaign mode, and I personally just do not like that (and I know plenty of people who agree with me). At launch there will be four planets with more than 8 maps to play on. For comparison, the original Battlefront had 16 maps, and Battlefront II even more. There are no space battles (again, at launch), and that truly upsets me. It’s no secret at this point how much I love space ships, and the space battles in Star Wars have always been some of my favorites. It’s an iconic Battlefront thing at this point, and removing them is such a step backwards I’m left speechless. The final proverbial nail is the knowledge that there will be absolutely no prequel trilogy content (*cough* at launch). That’s become such a common statement in the gaming industry, “at launch.” Because nowadays everything is digital, and it’s extremely easy to get new content to players after a game has already hit shelves. But that’s almost always for a price, and it pushes games out the door before they are finished or with so little content that 10 years ago the developer would have been laughed at. DLC is EA’s shtick, and unfortunately it seems to be the case here as well. 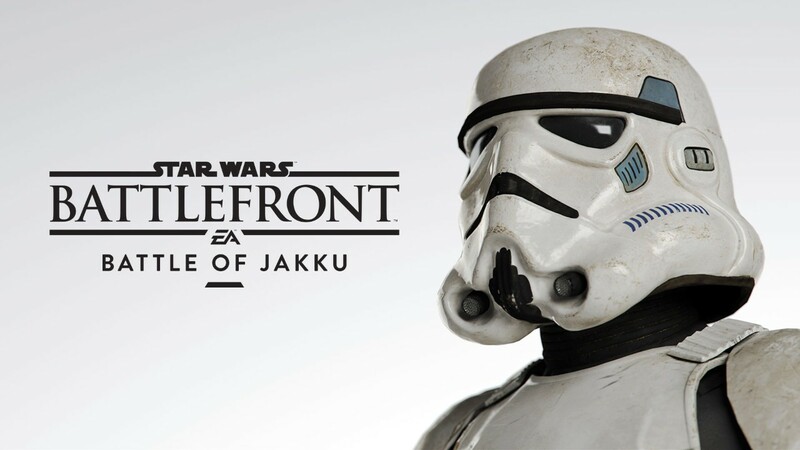 One DLC has already been announced; the Battle of Jakku, which may or may not include the game’s first space battle (information has been contradictory here). That one, at least, will be free to everyone, which makes me wonder why they don’t just finish it a month earlier; we’ve presumably already seen the map in question during the trailer when Boba Fett shows up. But further DLC can also be expected; probably prequel-content. Maybe we’ll see the Battle of Geonosis or maps like Felucia and Utapau if we’re willing to pay more money for them. I understand the prequels aren’t particularly loved by fans, but even I enjoy their setting and the stories that could be told through them. Some of my favorite Battlefront maps are prequel maps. Plus, The Clone Wars animated series is fantastic enough to make up for the lackluster films. We have an entire generation of Star Wars fans who grew up with the prequels; they deserve their own experience as much as older fans do. And what I find really annoying is that DICE’s reason for not including prequel content is because they personally don’t like them. Maybe I’m unfair here, but I feel like a game being made “for fans” should be made for fans and not the developers. Nothing says “awesome gaming experience” like pre-launch DLC announcements. One interesting change from the original games is how classes will work in DICE’s Battlefront. Put simply, there won’t be any. My understanding is that players will instead be able to switch around weapons and gear à la Call of Duty, thus creating their own classes. If we can have multiple characters or loadouts saved for easy swapping in battle then I’m all for this change; customization options are always welcome and this allows players to tailor their experience and play styles however they want. But I think players will be extremely unhappy if you’re stuck going into a match with only one loadout. I want to have my own trooper, yes. But I don’t want to be confined to one role in a game like Battlefront, where you are supposed to strategically choose your class as the battle goes on. The really disappointing thing about this is knowing what could have been. Years ago (that is, around 2006 and 2008) we got some shady information that Free Radical Design (developers of the TimeSpitters and Second Sight franchises, and nowadays known as Crytek UK) was working on a “Battlefront III” game for LucasArts. A few years later we saw some leaked gameplay footage for said game, which you can see in terrible quality here. Even with that terrible quality, this looks like a well-made game. The models and textures seem lacking, but remember that this is pre-alpha back in the late 2000s. The gameplay itself hints at some really great things. That Eta-2 is shown taking off during a ground battle, flying into the sky and heading up into space to do battle amidst capital ships. There are cutscenes for a campaign mode, giving single-player-loving individuals something to enjoy. But Free Radical lost their rights to a Star Wars game and had legal problems, and Battlefront III got tossed along with its tech. I don’t want to come off unfairly, but I truly feel that DICE and EA have dropped the ball. I had such high hopes for this game. I pleaded with no one in particular that we have smooth ground-to-space battles. I dreamed of giant capital ships, of entering an Imperial Star Destroyer and having to spend a large amount of time infiltrating the many corridors to finally cut off its engines or destroy its shields. I wanted to see huge battlefields that you could almost get lost in, and persistent engagements that could take multiple hours to complete. This is my own personal vision, yes, and what I want may not necessarily be what everyone else wants. But even so, what we are getting at the moment seems very lackluster. I wanted something BIG. But so far all I’ve seen is something small and mostly unimpressive. It’d be like if you were sitting around waiting for the Executor to enter the system and save you, and then an Acclamator shows up. That’s the thing under the engines, btw. I hope I’m wrong, and that Battlefront will be a great game. I’m very concerned with what I’m seeing, but as of now I’m still considering getting it. Maybe, though lacking in content, the gameplay and combat will be enjoyable. Maybe she’ll have it where it counts. Maybe we’ll get really good DLC at a fair price that adds everything fans have been wanting. I don’t mind paying for extra stuff if the price is fair and the quality is good. Perhaps someday I will be able to infiltrate that ISD. But for now I’m not excited. At least The Force Awakens is looking promising. I have no desire to buy the game without Space and Prequel stuff, for one if it’s really based on OT only, well literally only 2 of the major battles of that are on the ground, and the space portion of the second one overshadows the ground portion. As for the prequels, yeah as films their not as good as the OT, but as a setting? I think they are even stronger in many ways, especially in ways that are important to a video game. Namely locations. I am way more interested in fighting in a crazy giant blue flower land like Felucia than I am interested in fighting in some random generic forest like Endor. It’s a sci-Fi shooter, I want planets that make me think im on a crazy alien world at least sometimes, the only planet in the OT that really works very well for that is Bespin and by all accounts so far even THAT’S not included. Plus we all know the Clones are just way cooler than Storm Troopers. 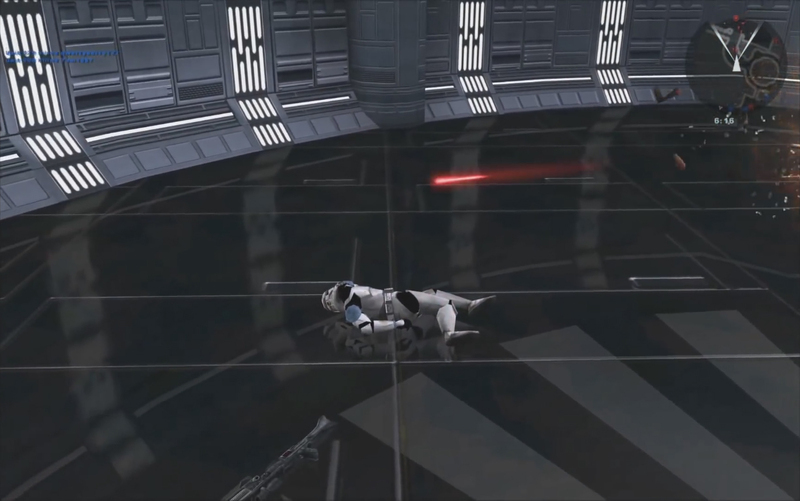 And Droideka’s were the most fun thing to play in Battlefront II, and that’s not even mentioning all the stuff they could include if they dug from the Clone Wars animated series. Prequels definitely bring a lot of content to a war-based game. I can’t be sure, but I suspect that they are banking on that to sell more DLC. Battle of Felicia; $10. Battle of Utapau; $10. There’s so much content, not just in the films but The Clone Wars series, that can be converted to DLC. Next Post Just How Important is Scientific Accuracy in Jurassic Park?